Did I Sprain My Ankle or Is It Broken? Ankle Sprain: An ankle sprain is typically a problem from twisting of the ankle during walking or running. It may also occur while playing sports when landing or stepping on an uneven surface (as in someone elses foot). 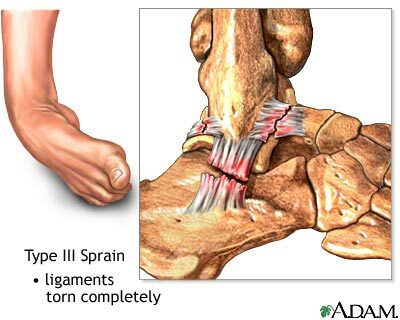 The most common sprains occur to the outside of the ankle, but can occur less commonly on the inside of the ankle also. The injury involves straining or even tearing of the ligaments of the ankle and will usually be accompanied by swellilng and bruising. Due to the swelling, the pain is also usually significant. Treatment options should include ice, compression (as in wrapping), rest, and elevation. It is recommended that an x-ray confirm no bony involvement as sprains heal more quickly than fractures. Displaced Fracture: Fractures through the talus, tibia or fibula are common in ankle fractures. If the fracture is displaced, it is more emergent and should be treated either by positioning and casting or possibly surgical correciton. It is imperative that these fractures be evaluated to ensure proper healing, as a severely displaced fracture can cause deformity (best case if it heals) or not heal at all. Worst case, it can also injure other structures in the area (muscle, nerve, or blood vessels) a create a bigger problem. Nondisplaced Fracture: When the fractures through the talus, tibia or fibula are complete fractures but in good position, simple casting can be initiated to protect the position and allow proper healing. Continuing to use the ankle or walk on the fracture can displace an nondisplaced fracture and produce a bigger problem as above. Stress Fracture: When the fracture is really on a "crack" in the bone and not a complete fracture, it is called a stress fracture. This is the old "march fracture" soldiers would get from prolonged marching. Although it can't be displaced, it can worsen without proper care. The biggest problem with stress fractures is the inability to visualize a stress fracture on standard film x-rays for 14 days. With digital x-ray including the ability of computers to zoom and clarify images, a stress fracture can often be visualized earlier. If you are concerned you may have a severe ankle sprain or a fracture of any type, it is recommended that you make an appointment and get visualized. Proper care will return you to regular activities quicker and provide for better healing.